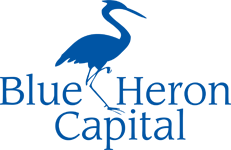 At Blue Heron Capital (BHC) your trust is our top priority. The confidentiality of your personal financial information is of paramount importance to all of us, and we will remain vigilant in protecting your privacy. This privacy notice is meant to help you understand how we use your private financial information, and to let you know what we do to help protect your privacy. What Information Do We Collect From You and About You? Information about your financial transactions, including securities purchased and sold, fund transfers, account balances, and other account activities. BHC does not sell your personal financial information to anyone. However, we do disclose your personal information to third parties or outside companies that help us process your transactions or service your account. One such company is the clearing firm which processes your transactions and acts as the account custodian. We may also provide information to outside service providers that held administer your accounts. Any outside company or third party provider must limit their use of your information to the purpose for which it was provided. BHC may also provide your personal information when permitted or required by law or regulation. Examples include providing information in response to a subpoena or court order, to cooperate with regulators, governmental authorities or law enforcement authorities, or in response to a request from a consumer reporting agency. Outside of these circumstances, we will not provide your personal information to third parties unless you have specifically asked us to do so. What Do We Do To Protect Your Personal Information? Content is provided for information purposes only and is not a solicitation to buy or sell any products. The information is not intended to be used as the sole basis for financial decisions nor should it be construed as advice designed to meet the needs of any individual situation. It is not intended as tax or legal advice and should not be relied on as such. You are encouraged to seek tax or legal advice from an independent professional advisor. Investment advisory services offered through Brookstone Capital Management LLC, a registered investment advisor. Brookstone and Blue Heron Capital, LLC are independent of each other. Fiduciary duty extends solely to investment advisory advice and does not extend to other activities such as insurance or broker dealer services. Advisory clients are charged a fee for assets under management while insurance products pay a commission, which may result in a conflict of interest regarding compensation. Ed Slott's Master Elite IRA Advisor Group™ membership requires the advisor to pay fees for membership, attend training provided by Ed Slott and Company, pass semi-annual examinations and meet other membership requirements. Membership does not guarantee investment success and is not an endorsement. Blue Heron Capital, LLC is not a law firm and Linda Gardner is not an attorney. Linda Gardner and Blue Heron Capital are not affiliated with or endorsed by the Social Security Administration or any government agency.